You can manage documents via the Document icon in the toolbar. You can either upload , embed, randomly downloaded documents, and even have a look at unused documents in your website. 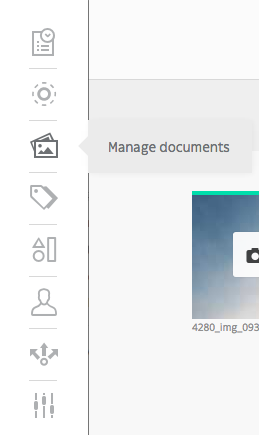 Uploading a document has never been this easy : just drag and drop the document in the designated area. Here is the trickiest part of the Documents section. You can have embedded documents from Youtube, SoundCloud, Vimeo and Dailymotion. You may need to have a look at Youtube’s and SoundCloud’s documentation, as you need an access token to have embedded documents from both of them. Random is a cool feature that allows to download random documents to your website from Splashbase. Clicking Unused document allows you to gather every unused documents on your website, so you can clean your database and get rid of useless documents.